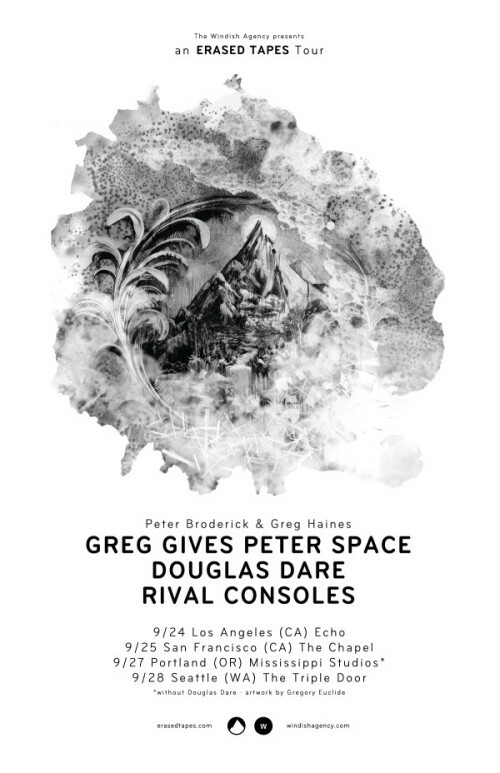 greg gives peter space will be playing four shows on the west coast of america in late september, as part of a mini erased tapes tour, with label-mates douglas dare and rival consoles. hope to see you! This entry was posted on Friday, August 1st, 2014 at 8:38 pm	and is filed under News. You can follow any responses to this entry through the RSS 2.0 feed. You can leave a response, or trackback from your own site. You lucky lucky people. Sounds like rather a fine line-up. Was fortunate enough to have seen Peter and Greg in London as part of the ‘Greg Gives Peter Space’ and was truly superb! A very memorable show for all the right reasons.